Find out why Shell's $73 billion buyout of LNG giant BG Group is a terrible deal for dividend investors. Royal Dutch Shell's (NYSE:RDS-A) $73 billion buyout of BG Group (NASDAQOTH:BRGYY) would be the second-largest oil merger in history, but long-term Shell investors should be asking whether the company overpaid. In examining the terms of the deal, and what Shell plans to do with BG's assets, I think it becomes evident that some skepticism of this deal is warranted. BG stockholders will receive .4454 shares of Shell class B shares plus $5.94 per share in cash for each share of BG stock. The $73 billion price tag represents a 52% premium for BG Group, and if the deal is approved BG shareholders would own 19% of Shell when the merger is completed in 2016. Why is Shell paying such an enormous premium during an oil crash? Shell claims the merger -- which should be accretive to operating cash flow in 2016 and earnings per share in 2017 -- makes sense for three main reasons: synergistic cost savings, increased reserves and production, and BG's strong position in the global liquefied natural gas, or LNG, trade. By far the biggest reason for the buyout is BG's global LNG dominance. BG ships to 26 of 27 countries that currently import LNG, and even without the merger it was set to become the largest LNG supplier to China. After the merger, Shell would operate 70 LNG carriers and be the world's largest producer of LNG -- for which global trade volumes are expected to grow by 67% between 2012 and 2025. Even before this megamerger, Shell was a huge believer in LNG. For example, the company is investing tens of billions of dollars into 12 global LNG projects including a floating LNG platform off the coast of northern Australia that will be one of the largest vessels ever constructed. The BG Group merger is part of Shell's long-term plan to improve capital efficiency such as its return on capital employed, which has historically lagged behind competitors such as ExxonMobil and Chevron. 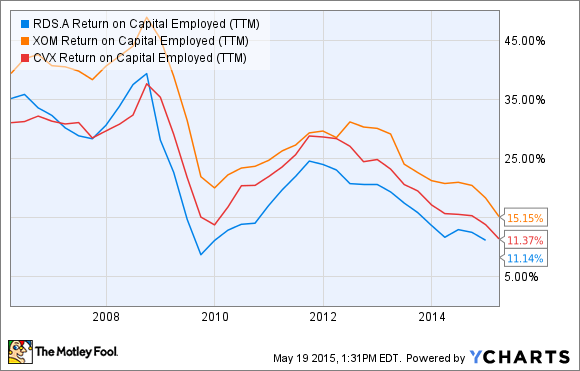 RDS.A Return on Capital Employed (TTM) data by YCharts. $2.5 billion in synergy costs from the BG Group merger between 2016 and the end of 2018. Approximately $30 billion in asset sales between 2016 and 2018, prioritizing debt repayment. Initiating a $25 billion buyback program between 2017 and 2020. The asset sales mean Shell's boost in production and reserves might not end up as positive as they appear. For example, according to The Wall Street Journal, Shell might have to divest BG Group's 29.25% share of the Karachaganak natural gas field in Kazakhstan. This gas field contributed 9% and 15% of BG's 2014 revenue and gas production, respectively, but under pre-existing contract terms the Kazakhstan government has the right to acquire this asset in the event that BG Group is sold. Than again, even Shell admits that the immediate effects of the merger would be to slightly lower ROCE which indicates that Shell is targeting this acquisition primarily as a way to grow operating cash flows and acquire assets that can be sold off later in an attempt to target capital efficiency gains. To put it bluntly, this deal will dilute the heck out of investors. Shell will issue 1.52 billion new shares of Class B shares,which will increase the number of Class B shares by 48%. What's worse, it appears Shell is preparing to slash its dividend by 50%, with management guiding for a 2015 dividend of $1.88 and "at least $1.88" in 2016. That's compared to $3.72 paid in 2014. This is most puzzling because in 2014 it generated $13.2 billion in free cash flow while paying out $11 billion in dividends for a dividend free cash flow payout ratio of just 83%. This should have made the dividend a lot more sustainable than such a drastic dividend cut would indicate. Could the oil crash account for the drastic cut? Well given that competitors such as Exxon and Chevron are likely to actually raise their 2015 dividends I think the answer is "no". Rather it looks to me like the massive premium Shell is paying for BG Group, and the large amount of shareholder dilution it will create is far more likely to be the culprit for the massive reduction in the company's dividend. Shell claims the long-term results of this merger will enhance total shareholder return potential. However, given the 50% dividend haircut guidance and large emphasis on buybacks that don't start until 2017, I think Shell investors should be skeptical. Going forward, watch closely to ensure management is delivering on this expensive deal's promised benefits, particularly improving profitability, and a return to dividend growth.